Hi! My name is Pico. 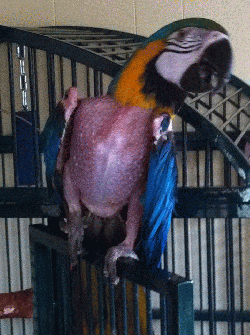 I`m a 12 year old blue and gold macaw. My friend Payaso and I came to Mickaboo after things changed in my old home and my family just didn`t have enough time for us. I do have a plucking problem, but it might get better if I get more attention. I may be a bit bald, but I`m still beautiful! If you have room in your home and time for me in your life, please contact the macaw coordinator.